We have all heard the rumors that Baja is abundant in the fishing department. Well, we can confirm that this is, in fact, true. 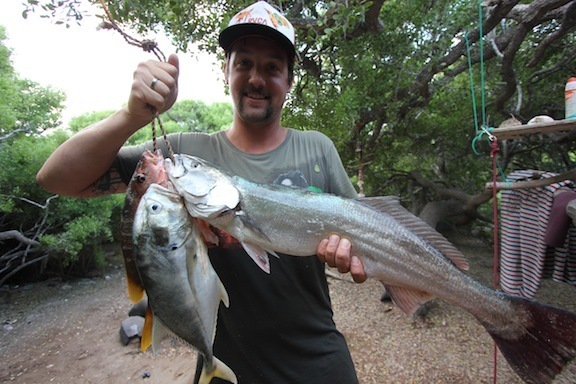 Between diving for shellfish, spearing, and surfcasting we have been successful in gathering many meals, for ourselves, fellow campers, and friends. The ocean has been good to us. The act of sharing the daily catch, as well as knowledge regarding the local sea life, is a wonderful way to meet fellow travelers. A camp can take on a true community feel when people come together to talk about fishing. In addition, finding creative ways to prepare newly identified sea life, with limited resources, can be a lot of fun! You have all seen the famous Sardinetaco barracuda fishing video, but that was just the beginning. Once we departed from the Bahia de Los Angeles, we headed for Concepcion Bay. With a little advice from an expat who ran the local fishing supply store in Mulege, we were confident that the shellfish we saw while snorkeling were, in fact, delicious. We dove for fresh scallops and clams, gathering about 4 dozen scallops (in a couple hours). The next day we gathered an estimated 100 clams in under an hour. 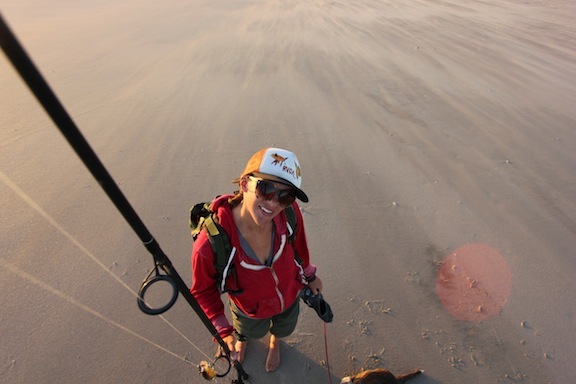 The satisfaction of self-sufficiency and the fresh taste of the ocean left big smiles on our sun-beaten faces. These meals were not only delicious, but they were great for the budget as well. A few days later we arrived in Scorpion Bay (San Juanico). At this location we had no luck diving for shellfish, or surfcasting, but the spear (Hawaiian Sling) was the big winner. 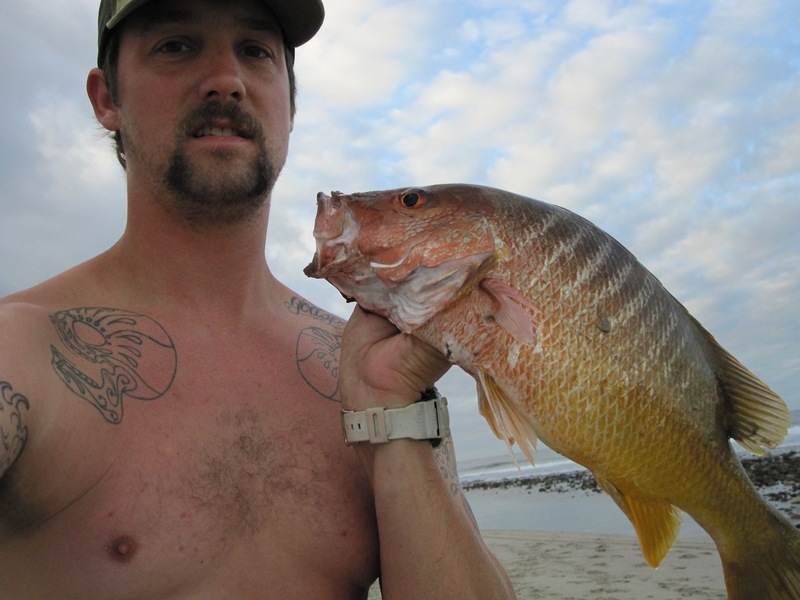 We were spearing small fish that I believe are called grunts, but I am not exactly sure. Either way they were plentiful, fun to spear, cooked whole with Old Bay, and super tasty. We hit the hot spot when we headed to Punta Conejo. With a little advice from the dude who ran the RV park called Palapa 206 in the city of Ciudad Constitucion we had bueno luck. The first morning we woke up at Punta Conejo, I was surfing by sunrise and amazed at how I was surrounded by fish in all directions. At any given time, in the early morning, there were countless fish jumping all around me. Being surrounded by fins in the water left me with an eerie feeling, especially because no one else was out there (or on the beach). The next morning I was fishing before the sun came up and BLAMO!! 10 casts later I had snapper, tuna, corvina, etc. The next day it was the same thing, and so on. The Corvina was huge and one of the snappers was also a beast. While I was gutting the fish on the beach I was attracting attention at the surf break. People in the camp were stoked because we all got fed, I negotiated our camping fee with fresh fish, and there was some epic surfing to boot. And the rest is history. Thanks dad for teaching me how to fish back in the day. I guess I remember all those things you taught me.